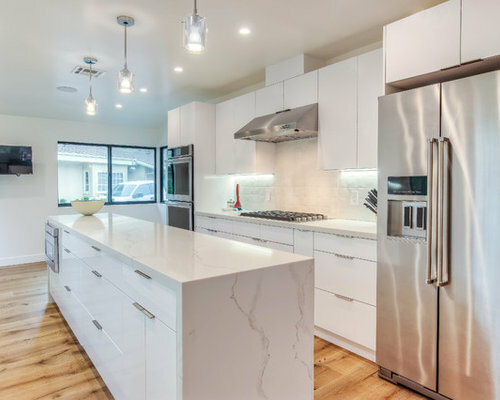 We are excited to showcase this new complete remodel project in Sherman Oaks, California. 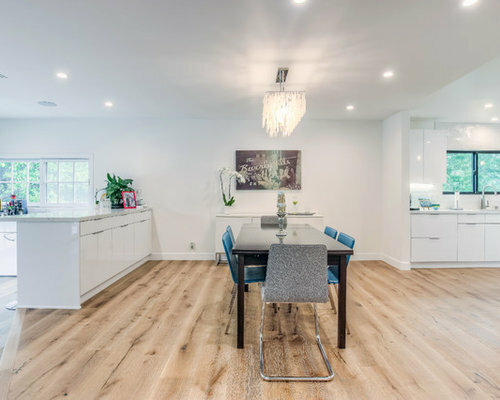 The space was completely transformed with a new open floor concept to give the kitchen, dining room and living room a spacious and bright look. 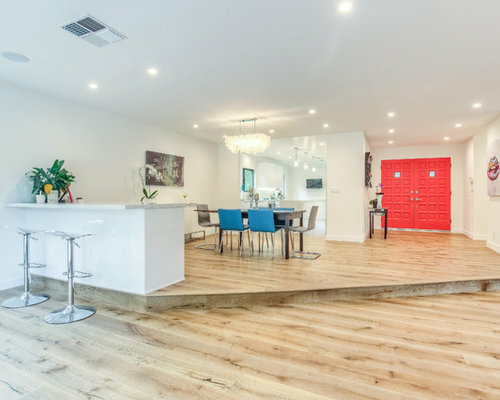 Every single design detail was chosen with our clients in mind to infuse the space with personality: from the beautiful and bold warm red front door to the custom-made fireplace with Venetian plaster walls and matching kitchen and bar area. 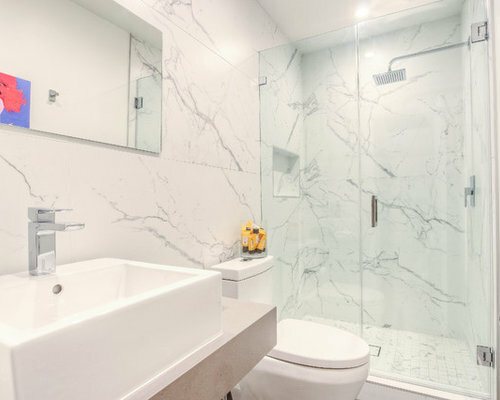 The guest bathroom followed the kitchen and bar colors and features all white porcelain tile walls and floors with a marbled pattern. The exterior of the house was also refreshed with newly painted walls, new floorings and matching black aluminum garage doors and windows. 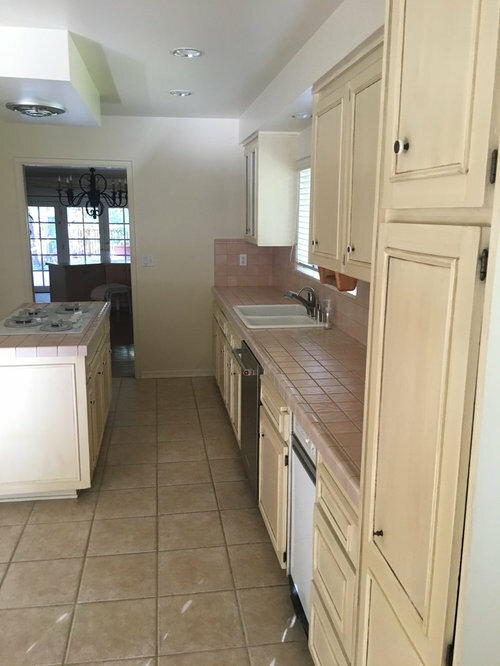 Scroll down to check out the before & after of this amazing transformation! 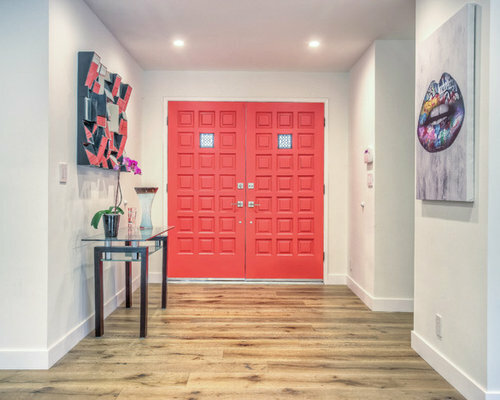 Featuring freshly painted warm red doors and white oak engineered wood floors, the new hallway was infused with our clients' personality to leave a bold and artsy impression. The renovated dining room, kitchen, bar area and living room feature an open floor place concept to create a spacious, airy and bright space. 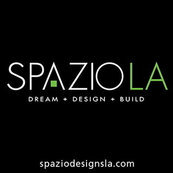 The space also includes new white oak French engineered wood floors. 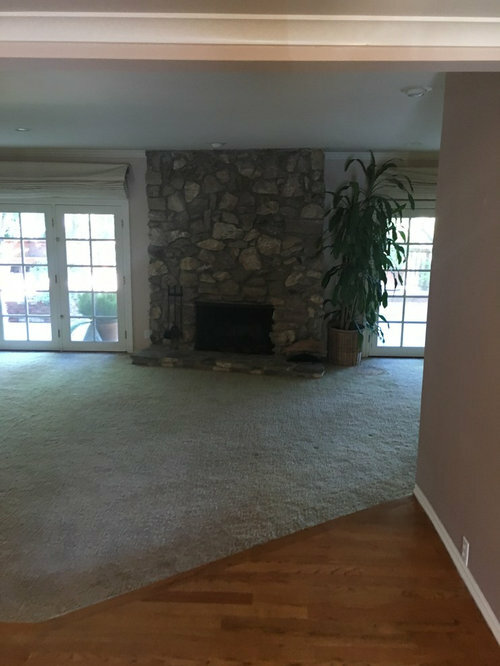 The renovated dining room, kitchen, bar area and living room feature an open floor place concept to create a spacious, airy and bright space. 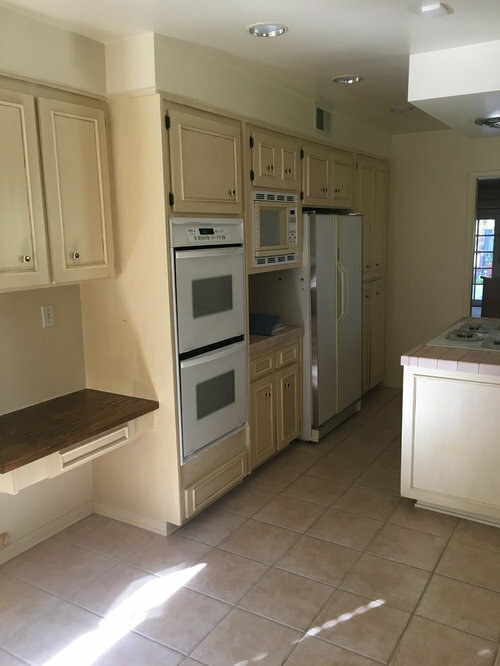 The center of the photo features the dining room, with the kitchen to the right and the matching custom bar to the left. 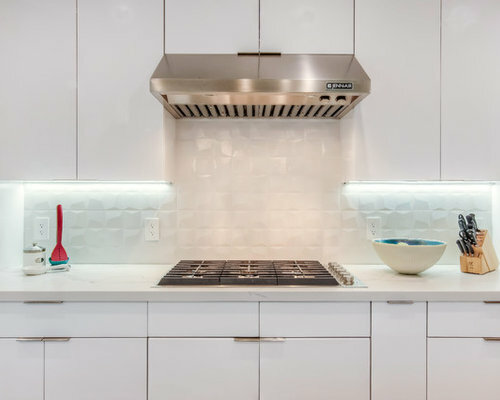 The new kitchen features Eurostone engineered quartz countertops, flat panel white cabinets with a lacquer finish, white textured porcelain tile backsplash, new black aluminum windows, all new Jenn-Air stainless steel appliances white oak French engineered wood floors. Exterior was completely repainted and features new black aluminum windows and garage door and new floors near the entrance. 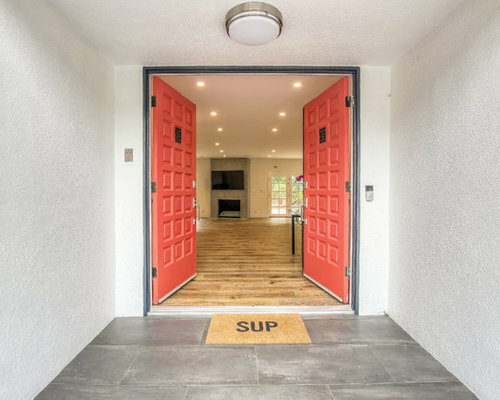 For a focal point and a pop of color, the main door was painted with a beautiful and bold warm red color contrasting with the black and white from the exterior colors. 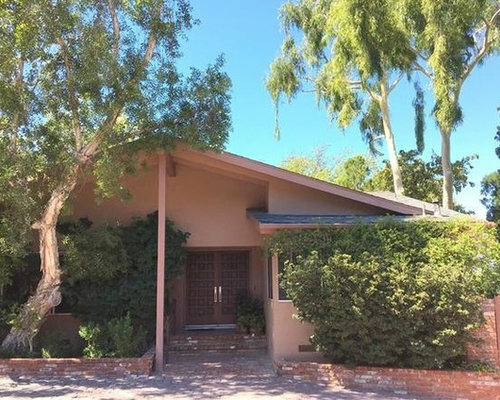 The exterior was completely repainted and features new black aluminum windows and garage door and new floors near the entrance. 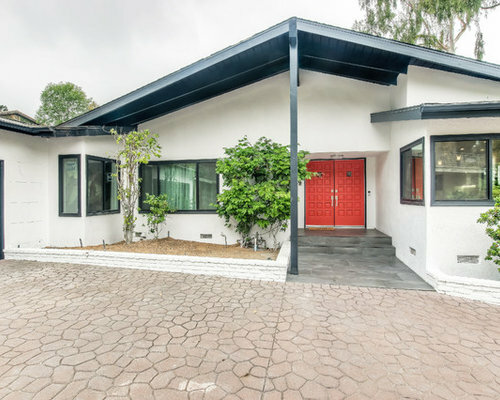 For a focal point and a pop of color, the main door was painted with a beautiful and bold warm red color contrasting with the black and white from the exterior colors. 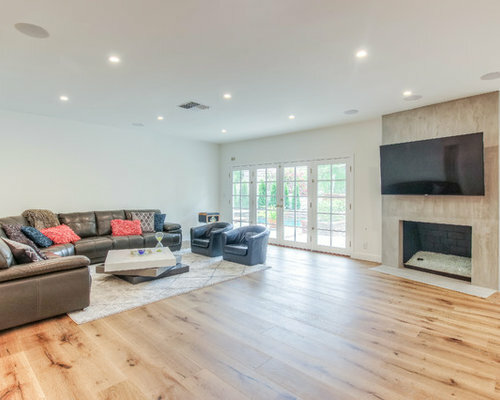 Renovated living room featuring new fireplace with Venetian plaster walls, new white oak French hardwood floors and a bright and spacious open floors plan. 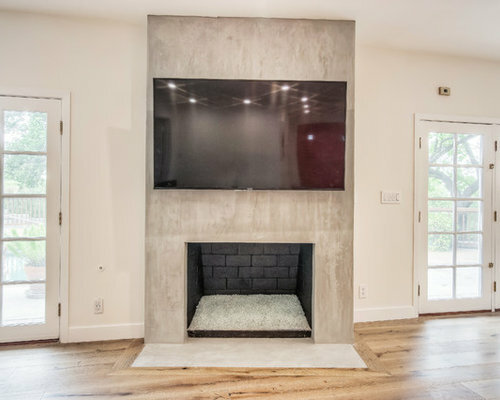 New fireplace in the living room with custom Venetian Plaster wall with a concrete look. 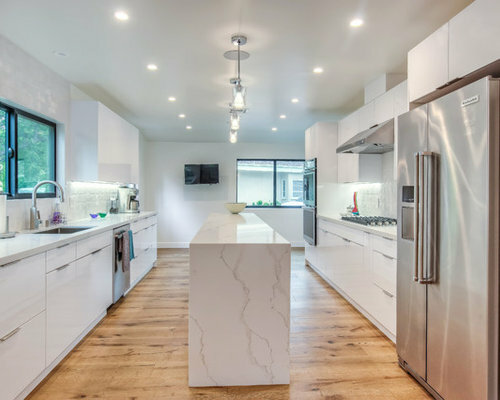 The guest bathroom was completely transformed and features custom freestanding quartz countertops from Caesarstone, matching porcelain tile walls and floors (Italian Calacata), walk-in shower with infinity drain and custom glass doors.